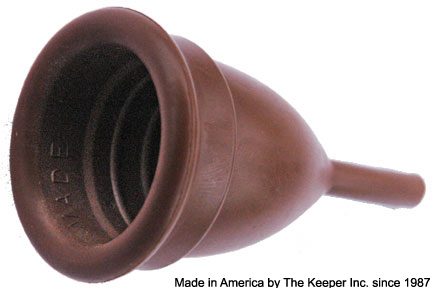 The Keeper is the only latex menstrual cup that I’ve seen on the market. While there are many advantages to using silicone (not the least of which is the many latex-allergic individuals), if you find that you are unable to use a silicone menstrual cup you may find that the Keeper is for you. While silicone based menstrual cups are in fashion now, the Keeper has been around for a long time and has a good reputation. In particular, it may be more durable than the silicone cups. The cup itself is a familiar bell-shape with ridges around the outside of the cup but a smooth, long stem. This may make it harder for some women to remove. In addition, you must be careful when inserting so you do not inadvertantly cause leaks. While it is offered in two sizes (B and A), it is only available in one color: brown.